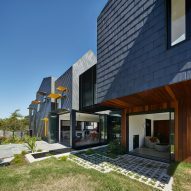 Slate shingles are arranged in various patterns across the outer walls of the house-shaped blocks that make up this multigenerational residence in the Melbourne suburb of Kew. 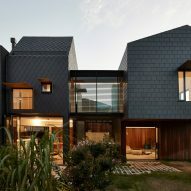 The slate patterns give each of the blocks its own identity, helping to fragment the scale of the 350-square-metre property known as Charles House. 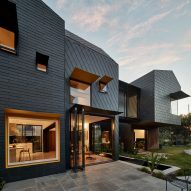 Wanting to differentiate the home from Kew's newly built "McMansions", the Melbourne-based Austin Maynard Architects selected slate to hark back to the area's more historic properties. 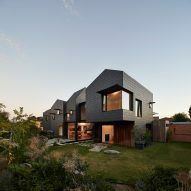 "Whilst some neighbouring buildings compete for attention and status our challenge was to create a home that didn't dominate the street and was imbedded in gardens," said the architects. "We aimed to create a home that didn't have a tall defensive fence, but instead offered openness and life to the street." 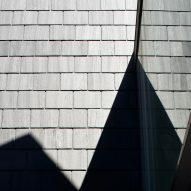 "We loved the lichen-covered slate roofs on many of these old Edwardian, Federation and Victorian homes and were keen to respond to and connect with this rich material history, without copying or creating a pastiche of the past," they added. 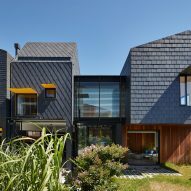 While the house is designed for an immediate family of five, the architects were asked to consider an arrangement that would also accommodate the extended family in coming years. 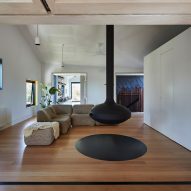 Spaces are designed to be converted, allowing for the family's grandparents to move in, and to cater to children as they grow into teenagers and young adults. 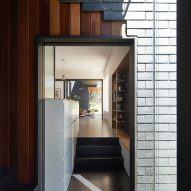 Lounges, dining and garage space with direct access to the north-facing garden are arranged across the ground floor of the house. 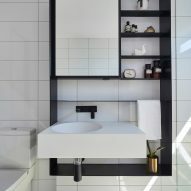 The rooms can be conjoined or separated depending on their use, with the anticipation that areas will need to be converted into student digs or a granny flat in future years. Wheelchair access to the garden has also been considered. 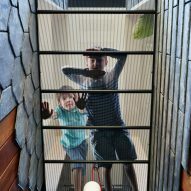 For the time being, adjoining children's bedrooms are located on the first floor, where they connect to hallways and a lounge. 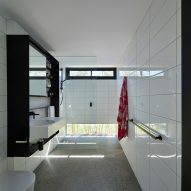 The master suite, its walk-in wardrobe and bathroom are separated from the children's area by a bridge. 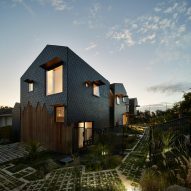 "Housing affordability, childcare and aged care offer some of the biggest challenges in Australian society," said the architects. "Multigenerational housing is a double-edged sword." "It is wonderful in many ways – a diverse family home is often a healthy family home; however, multigenerational homes also reflect the nature of our economy and the dire consequences of housing unaffordability." "We welcome a more complex understanding of what family means and recognise modern urban isolation, longer work days, child-care difficulties, increases in retirement costs and the inaccessibility to quality affordable housing – for not only our young, but increasingly the elderly," they added. A linear pond running below the bridge extends out into the garden, and areas of slate and timber cladding creep into the interior – visually reinforcing the connection between inside and outside that the design aims to achieve. Gardens wrap the house and seam with a school sports field at the rear of the plot. 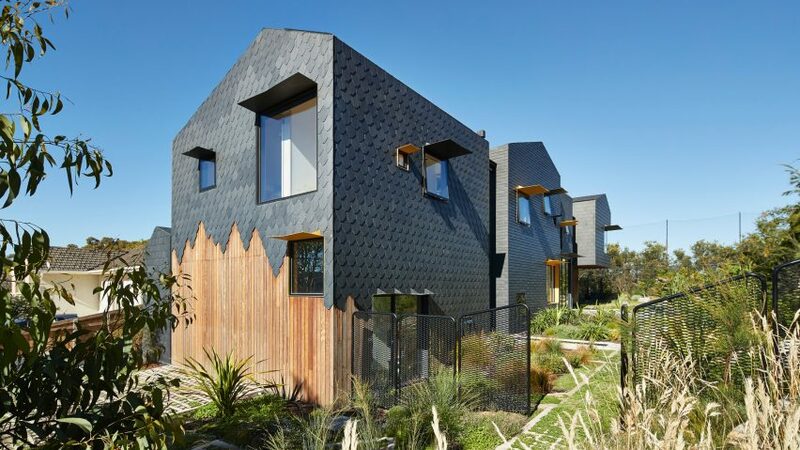 Landscaping by Bush Projects introduces a mixture of indigenous planting to the site, creating a "domestic jungle". 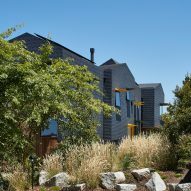 The scale of shrubs and grasses increases towards the outskirts of the garden, where it meets the mature eucalyptus trees of the school grounds. 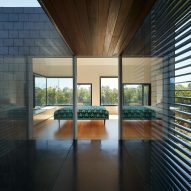 The project is one of the studio's most sustainable yet. 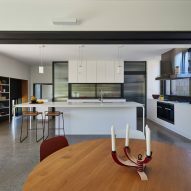 Horizontal awnings project over the double-glazed windows, helping to minimise solar gain in summer while keeping the house warm in winter. 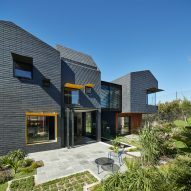 External blinds, adjustable louvres and roof-mounted solar panels also help to offset energy consumption. Photography is by Peter Bennetts Studio.